Why do door knobs still exist? As far as I know, in US, grip-and-turn style door knobs are still the most popular, as opposed to lever-style handles, which dominate in the rest of the world. Is there some UX advantage to door knobs that I am not aware of, which is the reason for keeping them around? Door knobs are standard in US homes for the same reason that exterior doors open inwards* -- it's "always been done that way". People grow up used to knobs, and specify knobs on new work, and thus this inferior mechanism is perpetuated. For some buildings (not private homes), some building codes now require lever mechanisms so that the handicapped can operate them more easily. In most buildings with high occupancy (schools, commercial space), outward-opening doors with crash bars are required. These codes came after some tragic fires, where people piled up against inward-opening doors. I don't see lever mechanisms and outward-opening doors becoming common in US homebuilding, unless codes are amended to require them. Considering how much pushback there has been over incandescent lightbulbs, I don't see that happening any time soon. Maybe if there is some sort of "handicap accessible" certification that would make a home easier to sell, that would encourage the change. * originally in colonial homes, doors that opened inwards could be barricaded from the inside to prevent hostile attackers from breaking down the door. The tradition has continued to this day. Doorknobs provide a worse UX for bears, which can be a useful feature for humans who want to keep bears out. ...elderly and disabled people find it easier to operate doors with handles. But so do bears. In British Columbia, bears have been known to scavenge for food inside cars—whose doors have handles, knob advocates point out. Pitkin County, Colorado, in the United States, has banned door levers on buildings for this very reason. One newspaper columnist in the pro-knob camp has noted that the velociraptors in “Jurassic Park” were able to open doors by their handles. They are harder for little hands and jumping pets to open (though turning a lever door handle to the vertical also works for these purposes). They are also somewhat less likely to have things catch on them (bag straps, stray elbows), especially in confined spaces. Doors are either left-handed or right-handed, depending on which way they open. 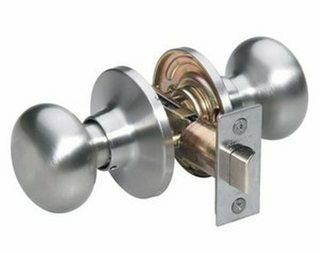 Doorknobs can be installed on either side of the door. You will likely find that less material is needed for a doorknob as well, so they are cheaper. 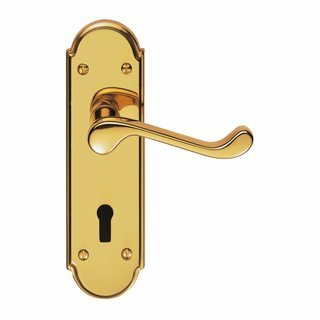 The handle on a handle provides leverage, which means it takes less weight/force to operate the latch mechanism (and less force to overload the mechanism too), so a Handle's mechanism needs to be stronger to support the same forces a doorknob would be exposed to. Also, just the shape of the lever means there is more metal..... A knob would have much less raw-material than a handle. Here's a google-search images for 'door handle'. Note how almost all the handles are specifically shaped. Those that are not specifically shaped, often have a base-plate that makes the mounting different for different door-sides. Only a few of the handles have a round/ambidextrous handle and mounting plate. 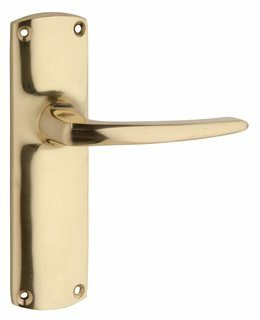 Out of interest, door handles normally have a 'stop' built in to the handle which limits the handle's travel to avoid stressing the actual bolt mechanism in the door (on the other hand, knobs don't have that leverage, so they let the mechanism in the door be the 'stop'). 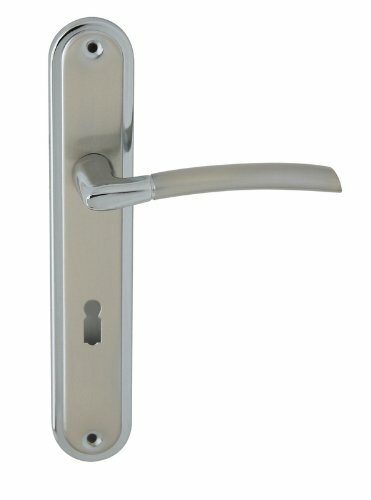 This mechanical stop requires the handle to be securely fastened to the door, so handles (with their additional leverage) need a stronger mounting (the mechanical stop in the handle also often prevents you from being able to reverse the handle on the mounting plate). In other words, the ADA recommends against door knobs, but does not require lever handles. Do note that the ADA does not apply to all doors in the country (private residences which are not also used for business purposes do not need to adhere to the ADA, for example), and the ADA only applies to things built (or modified) after the ADA went into effect (July 1992), so an old building that hasn't been updated wouldn't necessarily be subject to the ADA standards. This makes the appearance neater and the installation easier than the typical European handle, which must have a separate lock. The USA is a country of low material costs and high labour costs, so the convenience of installation may be relevant. Other advantages: things don't get caught on them as readily (I've torn a shirt or two in my time.) And certainly they're a lot less likely to injure you should you ever fall on one or scrape against it. 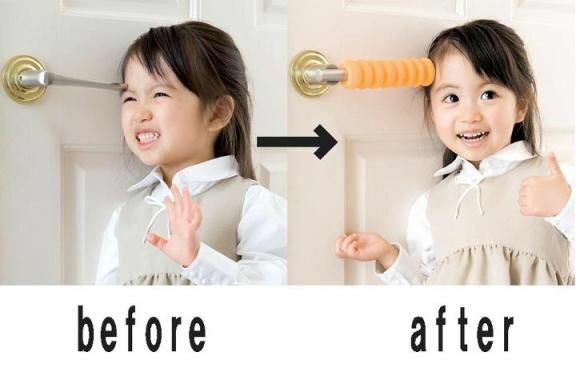 This is definitely an advantage for boisterous children who may have their heads at doorknob height. The point about being harder for children to open can be either good or bad. This is a classic case where the decision-makers are not the users. Doorknobs tend to be installed by home builders, whose goals are minimizing cost and minimizing cost and also minimizing cost. Round door knobs are cheap, plentiful, and understood to be an acceptable solution. For internal doors, this makes them the norm. Lever-style doorknobs are much more expensive, and can be trickier to be install. 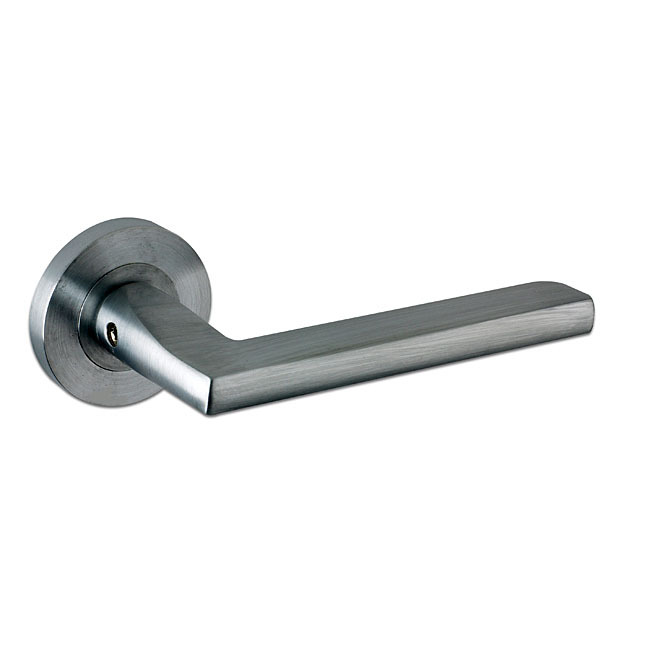 It doesn't matter if a doorknob is slightly out of level, but it's very obvious with a handle-style. There is also a huge installed base out there--billions of doors which are set up for round doorknobs. Retrofitting a lever-style door opener may require replacing the door and/or modifying the striker plate side. Inertia and cost wins. In industrial installs and new construction, you frequently see lever-style doors. As well as some ergonomic benefits, they have the advantage of generally being more durable. A business is responsible for maintenance of its property in a way that a home builder is not. Vancouver has banned doorknobs through its building code. The motive is for greater accessibility. And I can think of several reasons why levers offer a lot more affordance. Elbows, forearms, feet, items gripped in a hand, butts can all be used to open doors with handle knobs... but that is or will be discussed. I recommend this fascinating article on the topic. They seem to be the cheapest in the stores. Both in the US and when I was in Ukraine. So the question becomes, why are they the cheapest? My hunch is it's a result of round knobs all looking essentially the same, which caused more competition among manufacturers, which lowered their price, so they became more popular, more factories invested in the tooling to make them, and they've been cheaply cranking them out ever since. There's really nothing wrong with the functionality (UX) of round door knobs for most people and from an mechanical engineering standpoint they allow less leverage to be applied to the door. This allows a less expensive knob assembly and door. All in all, they're less expensive than lever handles. And lever handles are more likely to injure a child if they fall against them. Although ergonomics probably have very little to do with it, doorknobs do have an ergonomic advantage. A doorknob can be grasped at any angle, whereas a horizontal lever must be grasped palm down (or up, if you prefer) which isn't a natural position. The natural position of the hand is palm inwards, slightly down. Also, a doorknob is usually pretty spherical, which also happens to be the natural position of the fingers. Levers come in quite a few shapes, most of them designed for style and not for ergonomics. Sometimes an awkward pose of the hand is required to grasp it properly. That said, levers generally don't require grasping to open, and the differences are pretty unimportant. If I were to run a heuristic analysis of buildings, I'd find that most users are familiar with doorknobs, and while they might express a preference for levers, it doesn't factor into their decision to enter a building. Additionally, I would likely find that mortise locks require a heavier door and cost several times more to purchase/install. Thus, I would conclude that doorknobs provide an increased ROI on the margin vs. door levers with a minimal impact on engagement, in spite of their their inherent disadvantages. This wouldn't be the best decision for the user, but it's the sort of compromise we make on a daily basis in business. In the building in which I currently live, we used to have several doors with lever-style handles. They were actually removed and replaced with doorknobs, because people kept putting too much pressure on the levers and breaking the mechanisms. From this I infer that levers might not be a good choice for very high-traffic doors. A broken mechanism is the least usable one of all - and obviously the expense plays a part as well, for whomever has to pay to replace it. Although it doesn't seem very practical for inside houses/apartments, many office and condo/apartment buildings use "panic bars" and sometimes thumbpiece mechanisms instead, for highly-trafficked doors; less frustrating than doorknobs, but still difficult to break accidentally. So it's not entirely a competition between doorknobs and levers - there are other options available. Not the answer you're looking for? Browse other questions tagged ergonomics household or ask your own question. Why don't all washing machines beep when finished? Why “heat & cool” buttons on air conditioner remote controls?